While spending 9½ years in the Indiana State Prison for robbery, John Dillinger hooked up with a number of unsavory characters that would later form the Dillinger Gang. 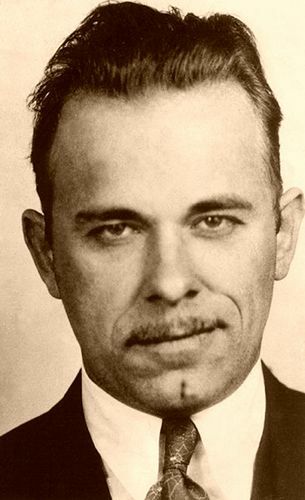 Dillinger was paroled in May 1933 and and almost immediately robbed a bank in Ohio. Police arrested him on September 22nd and while he was in jail, officers found a document which seemed to be a plan for a prison break, but Dillinger denied knowledge of any plan. Four days later, using the same plans, eight of Dillinger’s friends escaped from the Indiana State Prison, using shotguns and rifles which had been smuggled into their cells. During their escape, they shot two guards. it was many of these escapees who hooked up with Dillinger to form the ruthless criminal gang. Dillinger, along with such infamous names as Baby Face Nelson, Homer Van Meter, Eddie Green, Harry Pierpont, Charley Makely, Russell Lee Clark, John Hamilton, and Thomas Carrol soon began to terrorize the Midwest over the next year, killing as many as 16 people and robbing as many as 20 banks. With the exception of Lee Clark, who received a life sentence behind bars, all of the gangsters met violent deaths before the end of 1934. Dillinger, who escaped jail twice, was declared “Public Enemy No. One” before being killed by FBI agents in front of the Biograph Theater in Chicago on July 22, 1934. By Kathy Weiser-Alexander, updated March 2019.